There is something very human in the story of Tobit that we hear today. 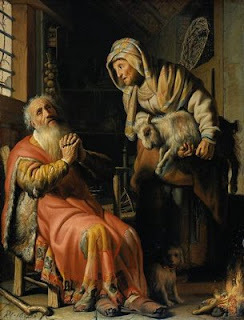 Tobit is struck blind by an accident of nature, and after a period of time his wife has to go out to work. One day at her work she is given a present by her employer. Tobit does not believe his wife when she says that it was given to her. He tries to make his wife take it back. Have you ever noticed how hard it is for us to receive charity? We have no problem doing works of charity, but when it comes to us being on the receiving end we are a wee bit different. It is good to allow ourselves to receive charity. It is an act of humility because by doing so we acknowledge that we are not totally self sufficient and are often in need of help. Even Jesus accepted charity without question. He allowed people to give to him even if he was the only person alive who could have done without any charity. The next time someone wants to do something for you or to give you some charity and you feel the heckles rising.....ask yourself why?